You can tweak your FTP settings in this area if you want to try and maximize your transfer speeds. 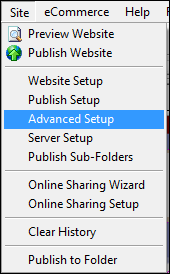 From the Site menu, select Advanced Setup. You can change your Advanced FTP settings. That is the best way to see if you can maximize your throughput. If you wish to go back to the original settings, click the Reset button. The selection "The software generates the index.htm file when needed" means that it will automatically generate the index file for your homepage. There may be a case where you don't want to generate the index file if you are only using the eCommerce module on your website. 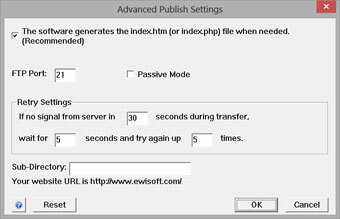 If you built your website with a different software and only use the Ewisoft eCommerce module then you won't want to generate the index.htm file otherwise it will overwrite your main website homepage. If you want to publish to a testing folder for your own testing purposes, you can specify a Sub-Directory .